But wait! What about non-SMS chatting? Can I keep using Hangouts for that? So you've heard the news, right? Google is officially pulling the plug on Hangouts' ability to handle SMS messages, just three years after ceremoniously adding that function into the app. The goal back in 2013 was to turn Hangouts into a truly universal messaging solution -- a single spectacular standard that'd work across all platforms and types of devices. These days, Google is intent on converting Hangouts into an enterprise-targeted tool -- and at the same time, pushing regular consumer users toward its newer Allo and Duo chat apps. Unfortunately, both of those apps suffer from the same foundational problem. And neither is designed to handle SMS. We could talk for days about the confusion and frustration caused by Google's ever-shifting vision for its mobile messaging products -- but we've done that plenty before (I'm particularly proud of the time I used an imaginary conversation to drive home the point earlier this year). So instead, let's accept that an SMS-free Hangouts is the new reality -- and let's move on to discussing what that actually means and what we should all do next. As it turns out, this latest pivot is pretty nuanced, so the answers really depend on your specific situation (yuuuup). Below is a piece-by-piece breakdown along with my advice for each scenario. Find the category and subcategory that applies to you, and get a move on. If this description fits you, the clock is ticking. Starting May 22nd, you'll no longer be able to use Hangouts to handle your SMS text messages -- period, end of story. Android Messages also supports the next-gen RCS messaging standard, so if/when any significant number of carriers and manufacturers gets on board with that system in the future, you'll be ready to roll. Android Messages doesn't, however, back up and sync your messages so you can easily keep them when you change phones -- nor does it let you access your messages from multiple devices (e.g. a tablet) or platforms (via any sort of desktop or web app). And that's where our next option comes into play. Get Pulse. There are plenty of good messaging apps on Android, but Pulse is the one I personally use post-Hangouts, and it's what I'd recommend for most people. Pulse is basically like a better version of Hangouts, quite frankly -- at least, the SMS-specific side of the equation. It lets you do things like pin messages to the top of your messaging list, create custom color profiles for different conversations, search through your messages for a specific term (imagine that! ), and use common-sense gestures to get around the app. The basic Pulse Android app is free, but you will have to pony up a few bucks if you want to sync messages and/or use the app in multiple places. You can choose from paying 99 cents a month, $1.99 every three months, $5.99 a year, or a flat one-time $10.99 fee for a lifetime subscription. That fee allows the developer to provide strong end-to-end encryption (more on that here) and also, y'know, to make a living. Congratulations! If you're using a Google Voice number, you can stick with Hangouts for now. That being said, it seems safe to say the writing's on the wall. 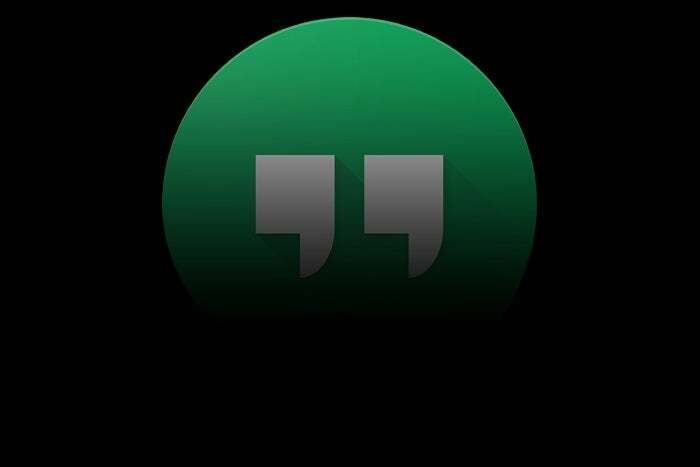 Google may not be ready to pull the plug on Hangouts-Google Voice integration just yet, but it's likely only a matter of time until that happens. Hey, go for it. As of now, there is no formal plan for removing GV support from the Hangouts app. Just don't get too comfy. Google's making it abundantly clear that it wants to free Hangouts from its previous consumer-centric purposes, and it's hard to see it as anything but inevitable that GV texting will come on the chopping block soon. Fi folk are in the same boat as Google Voice users in that there's no immediate need to ditch Hangouts yet. Again, though, it's almost certainly just a matter of time until that axe falls. Then don't change a thing. The upcoming May 22 kill date for SMS support in Hangouts does not apply to Project Fi subscribers, and Google has yet to divulge any specifics about if/when Fi users will be forced out in the future. Just don't get too cozy, 'cause the safe bet is that your eviction notice will arrive before long. Why put off the inevitable, right? If you're ready to move on and save yourself the trouble later -- and all you want to do is send messages from a single device -- Google's Android Messages app is the simplest way to do it. No frills, no fuss -- just a clean and simple app that gets the basics done, as I outlined above. Just note that after you open up the new app and approve the prompt to make it your default SMS application, you'll need to take one further step: Go back into Hangouts, open its settings, and select your account on the screen that appears. Find the section labeled "Project Fi calls and SMS" and uncheck the toggle next to "Messages." That'll finish removing the link between Hangouts and your messages; if you don't do that, things will be noticeably funky. Get Pulse. See my full explanation above for all the nitty-gritty. Again, though: Note that after you open up the new app and approve the prompt to make it your default SMS application, you'll need to go back into your account's section of the Hangouts settings and uncheck the toggle next to "Messages" under the "Project Fi calls and SMS" header in order to complete the transition. Yes! No matter which of the above categories you fall into, you can keep using Hangouts for IM-style "chat" messages as long as you'd like. At some point down the line, you'll be prompted to switch from the Hangouts app you know now to the newer Hangouts Chat app, but the basic functionality should remain the same. Just note that without SMS support present, Hangouts will essentially just be another isolated chat service -- one that, in other words, will work only for communicating with people who are also actively signed in. And I'd argue that the pool of present people will diminish pretty quickly once the SMS switch gets turned off and folks start moving away from the app for day-to-day use. Particularly with the ongoing pivot to enterprise-oriented features and the fact that Google is no longer preloading Hangouts on Android phones as the default messaging app, the incentive for regular consumers to use Hangouts in any way is only going to keep decreasing over time. So if you really want a chatting app beyond just basic SMS, take your pick. You can try out Google's Allo -- if, um, you know either of the other people who actively use it (and if you don't mind having an app that works only on a single phone, with no multidevice support or desktop interface). Or you can go with any of the more established chat platforms, like WhatsApp, Facebook Messenger, or any of the other popular communication apps of the moment. If none of those options sounds enticing, just stick with SMS for your text-based communication. Or you can always just wait a little while and see what other options show up in the foreseeable future. If history is any indication, it shouldn't be long before Google comes out with Yet Another New Messaging Service for you to consider.